4) Ayam Athma Brahma – “This Self is Brahman”. This occurs in Mandukya Upanishad of Atharvana Veda. There is a story connecting all these four Mahavakhyas. A sishya went to a guru and told him “Sir, I want to know about Brahman”. Guru asked him to go and meditate on the vakhya “Prajnanam Brahma”. Since this is a vakhya given for meditation practice it is called abhyasa vakhya. The sishya went and meditated on the vakhya. When he meditated on the vakhya, he was startled by the mind-boggling discovery he made and wondered whether the Consciousness that activates him can be the supreme cosmic force, Brahman. So he came to the guru again for confirmation and guru replied affirmatively “Tat Tvam Asi”. Since this is given as a teaching, it is called updesa vakhya. The sishya went and again meditated for a time and then returned to the guru and told him, “Aham Brahmasmi”. Since this vakhya is uttered after realisation it is called anubhuthi vakhya. Guru agreed with him with this statement “Ayam Athma Brahma”. So this is called sammatha vakhya. Mahavakhya removes the misconception that Self is different from Brahman. As Brahman is the source of security, peace and happiness, bhedha buddhi makes one run after these searching them elsewhere and Ikya Buddhi i.e. knowledge of identity, makes one realize them within oneself. Abiding in this knowledge of Jiva Brahma Ikyam at all times, gives one Jivan Mukthi, i.e. Moksha, while living. In that sense mahavakhya gives one, liberating Self Knowledge. But we should always remember that when Self is equated with Brahman it is like equating water in the ocean with water in a container in the seashore on the basis that both have the same chemical formula H2O or like equating tiny waves in the ocean with the mighty ocean itself on the basis that both are essentially water only. It is not the individual with the upadhi of sareera triam, equated with the Brahman with the upadhi of prapancha triam. We shall see this briefly taking one of the mahavakhyas for analysis, namely the updesa vakhya. 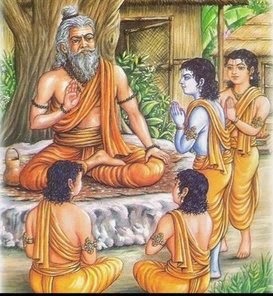 “Tat Tvam Asi” occurs in Chapter 6 of Chandogya Upanishad, where Guru Uddalaka instructs sishya Svetaketu through examples the nature of Brahman. The importance of this upadesa vakhya can be seen from the fact that it is repeated nine times in the course of the teaching. This statement is in the form of an equation Tat=Tvam. Equating both sides is not necessary if they are same like, 5 and 5. Again equating both sides is not possible when they are different like, 5 and 8. Equating becomes necessary, only if they appear to be different but, on analysis, they reveal identity like, 5+1 & 8-2. That is what happens in this equation Tat=Tvam, when you take the lakshyartha for Tat and Tvam, instead of the vachyartha. 1) Jahallakshana – Taking the secondary meaning, excluding the primary meaning. For example when you order takeaway coffee, and you are asked ‘any sugar’ and you reply ‘two spoons’, coffee is given not with two spoons, but with two spoonful sugar mixed. 2) Ajahallakshana – Taking the secondary meaning, without sacrificing the primary meaning. For example when you order coffee, it is served in a cup which you have not ordered but understood. 3) Jahadajahallakshana or Bhagatyagalakshana - Retaining certain portion of the primary meaning i.e. primary meaning is partially included and partially excluded as in the case of eating a banana, where only pulp portion is included and the skin portion excluded, while understanding the statement. We are employing one of the three methods regularly for finding lakshyartha, when the vachyartha does not fit in. Only we are doing it automatically, without our being even aware of it. In the case of the statement, Tat Tvam Asi, when we take the vachyartha of both, we cannot equate the Jiva who is mortal and has all types of limitations and Brahman who is eternal and transcends all limitations. So we go to the lakshyartha of both on the basis of sastras, which is the pramanam for all matters concerning Self and Brahman, that cannot be objectified or conceptualized. Employing bhagatyagalakshana method and taking out the unequal upadhis ie sareera triam in Jiva and prapancha triam in Brahman we are left with Consciousness on both sides of the equation and that is identical. The same is done in anubhuthi vakhya, Aham Brahma Asmi, understanding Aham as standing for the Self , which is consciousness and not as referring to the individual as such with the body mind complex. The other two mahavakhyas, Prajnanam Brahma and Ayam Athma Brahma are much more straightforward as Consciousness is Athma, as per sastras. I also wonder how do you limit yourself to write only so much about a topic..